I arrived here about six hours ago, and have since had a shower and 5 hours of napping. You’d think it would be easy to just collapse and sleep for a week, but one of the more difficult things is breaking the ingrained 15 minute at-a-stretch sleeping pattern of the last 22 days! Well, last night was another fun and exciting trip into an unknown harbor! My plan, once I got close enough to the harbor, was to sail back and forth through the night, waiting for first light of dawn to come into the unfamiliar surroundings. This is typically what a prudent seaman would do … but then again, maybe a prudent seaman wouldn’t leave Portugal in December bound for the U.S. with only himself onboard. Anyway, the last few days of sailing have just been exceptional. Winds up in the 20′s and great waves for surfing, which kept us moving at averages of more that 10 knots … with short bursts of speed up to 18 knots! As those conditions continued last night, it seemed that just a few hours after the sunset, I was seeing the lights of Antigua … and in fact, I was! Once I got close to the harbor, I realized that until you actually ventured into the cut between the mountains of the island, there would be no sheltering from the wind. With the wind blowing 22 knots and seas rolling along at 3-4 meters, bumming around outside the harbor for 5 or 6 hours didn’t seem like a very pleasant or relaxing way to spend the night. So, I gathered up the notes that various people had emailed me on details of the harbor, and I hatched a plan. Since my initial itinerary was to head to Charleston, SC, I hadn’t put any charts of the Caribbean onboard the boat, and they weren’t included in the electronic chart information I had purchased for the navigation system. I was fully prepared for every other harbor in North America, the northern half of South America and ALL of Europe – but no Caribbean! All I had to work with were the emailed descriptions and a single very blocky geometrically shaped representation of the island. So, I plugged some waypoints into the GPS and headed in towards harbor. The AIS (Automatic Identification System) indicated a large cluster of boats inland, so I figured there must be a harbor around them! Inching along at 1.5 knots, the wind eventually subsided and the choppy seas went away, which left me with this incessant alarm on my electronic GPS plotter, warning me of a “dangerous AIS vessel” close by. While annoying, it was still comforting to know that I was near the harbor. After a while, I realized why I had stopped seeing the harbor lights. There was this larger ship moving right in front of me! You’d think I’d have seen something that big, but in the view of harbor, land and boat lights, until you identify specific points of light on land being covered and uncovered, ships with all sorts of crazy lights on them can easily camouflage the shore lights – and this one was doing a perfect job of blocking my view of the harbor. Arrgh … no wonder my AIS was sounding its alarm … this hulk was just 100 yards ahead of me, and I’m going twice as fast as it is! Thankfully, we’re talking only 1 to 2 knots here! All in all the presence of the other boat was a comfort, because its being there, meant we were in deep water – and I was right behind it. Before long, I found the first of the channel lights, which began to guide me right to the main dock at the Antigua Yacht Club. So, I rounded up my fenders and dock lines, and soon enough I was secured to the dock in Antigua! A few moments to take a breath and shrug off the tensions, kick off my dock shoes and grab that last can of Coke I’d been saving for the occasion. Then I stepped ashore … and was filled with this amazingly proud feeling. I’d just solo sailed across the Atlantic! This had been one of the very earliest goals of my life … one I can now take off the list. What a sweet feeling to be experiencing … under a bright full moon and a sky full of stars, there on the docks of Antigua. Here’s a pic of what a guy looks like after 22 days at sea. Not too bad huh? A few moments later, a security guard guided me to the showers and within an hour, I had washed off the first layers of 22 days at sea, and was horizontal in my bunk for a nap. So many thanks to everyone for following along on the journey – and thanks to the mysterious mother ship that guided me in last night. I think the awareness of that ship, in and of itself, reduced my blood pressure by half! Now, to work on any other remaining blood pressure issues. But from what I can tell though, Antigua looks like the perfect place to find an easy spot to relax for a few days. More coming soon, once I find land-based Internet … and oh yeah, some great photos too! As with all endurance events, managing fatigue grows more critical over time. I hit a wall for a time the other night, and not too unexpectedly after 17 days of sailing with minimal sleep time. I thought I’d been dealing pretty well with the issue, and was feeling unusually good – good enough to actually wonder if perhaps I’d not been pushing myself hard enough. The previous couple of days had been too hot during the day to sleep much, so I suppose something was building up inside, but remained hidden behind the excitement of breaking through 1000 miles to reach Antigua. It was around sunset. The winds typically calm down a bit then, though they sometimes change direction as well. Usually by midnight, they have settled in for the night, and the sailing is comparatively easy after that. The forecast was for an increase in winds to 20 knots plus though, so when the wind began to touch 20 knots, I was prepared for it. Otto (the Auto-Pilot) on the other hand, wasn’t too sure if he could steer it, as he/it steers to numerical data, and doesn’t have the added input of vision and kinetic balance, so when things gets wavy and windy, he often gets caught on the wrong side of the angle and loses control. We take a good smack usually when the boat comes around and goes out of control like that, at which point I quickly grab the tiller and “massage” the boat back on course before letting Otto resume his duties. The way this is done is by easing off the sheet entirely, running to the bow, sitting in rushing water and pulling on the line to furl the sail. This is accompanied by a furious amount of noise from the flogging sail, which consciously you get used to – but your sub-conscious doesn’t let go of the sense of impending doom until the last few wraps are finally contained. Fortunately, I’ve enough experience to make sure I set up everything just right in advance. But no matter how much you prepare, there’s just no way to know how much strength and endurance it will take to make it happen, once the action starts. The first third rolls up rather easily … but then the belly of the sail starts to fill and you have to fight that pull with all your might before getting to the last few wraps to secure it all. This also happens in the dark, mind you, with you there on the bow crashing forward into a dark and watery unknown … only illuminated by a bit of moon and your own internal memory of where things are. You keep thinking — there are easier places I could be – but then you feel that sharp wind and you take a snout full of salty air, the adrenaline kicks in and you just DO IT! Once that was all done, I cleared the lines and worked my way back down the deck to the cockpit and set the jib up. I found the proper course for the sail and trim and settled the boat down. I checked all the instrumentation, course and bearings and took a deep breath. It was after midnight, we had done our work and the new day had begun - time for my daily cookie! With the jib and main set, the boat speed came down to 8-10 knots and I was able to get back to my sleep regimen (previously explained in my “Ode to the Kitchen Timer“). By daybreak and with the bright sun filling the cabin again with light and warmth, I’d gotten some decent rest, and got up ready to assess the situation and decide whether or not to reset the A3. I put on my hat, gloves and parka and step out into the sharp cold of the winter night. 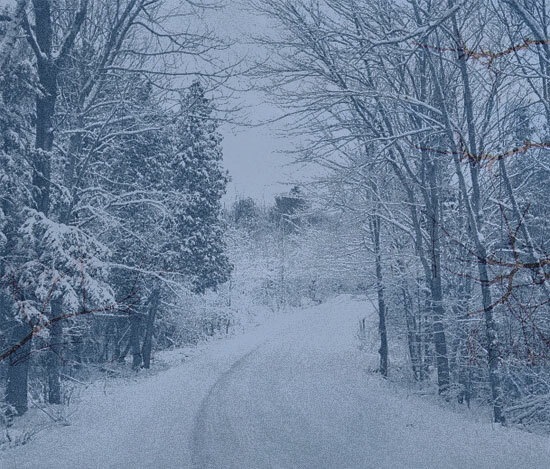 The snow crunches under my feet as I walk out the drive and down to the road, headed nowhere in particular. It’s very late on Christmas Eve, as I walk down the empty roads of a Northern Indiana night through the deep woods near my home. I don’t recall what year it was that I first began to take my Christmas Eve walk. It was a long time ago – maybe 30 years now, and since then, it has always been a mostly secret tradition with me. When all the festivities of Christmas Eve are done, once friends have gone off to midnight services, children off to bed, red suits with white fur trim packed away until next year and final gifts all wrapped – I take the time for myself … and undertake a little stroll through the brisk winter night. It’s always a quiet time – a time to take a breath that’s a bit deeper than usual and an exhale that’s a bit longer – a step without a direction or a designated purpose. It’s a time to appreciate being alone and to take in the special life I’ve been blessed to live. It’s a time to express and feel my peace within the wilderness around me. Most years I’ve walked alone down these roads on Christmas Eve, but occasionally friends have joined me, and together we’ve walked through worlds of fresh falling snows, deep colds, mild winter nights – sometimes right along the frigid lake’s edge, down desolate roads or through the small town park and town band shell – all lit up for the holidays. We’ve found it wildly fun to duck behind old oak trees, hiding from view of the occasional car that might be a well-intended offer of a ride. Several times, we’ve been spooked by the snort of a deer in the woods. Other times, I’ve walked to the top of a high dune and stood alone under the wide open winter sky. Other times, I’ve walked under the lights of our little town’s tall traditional tree that stands watch, as it always has – over every Christmas season. Year after year, the ritual repeats itself, and each and every time, at some point, I’ve quietly hummed “Silent Night” as I walked along. I always knew that one year I would be at out at sea for Christmas. That persistent intuition has manifested itself this year, when I find myself in the middle of the Atlantic Ocean all by my lonesome, 800 miles east of the Caribbean, and pushing my way westward to my home continent of North America, onboard this most splendid of sailing vessels … Bodacious Dream! I’ll still take my walk this Christmas Eve, but it won’t be as cold or as long as in past years, and any friends will be here in spirit only, as I will be walking alone fore and aft my little floating island – but it will be as special a walk as ever I have taken – only 40 feet to the bow and back again – a moment or two to take in the majesty of this vast oceanic landscape. As I take my Christmas Eve walk this year, the hull beneath me will be skimming across the timeless waters of this undeniably amazing planet. These waters, through the cycle of eons – are kindred spirits to the snow crystals I trudged over so many Christmas Eve’s past. And though I am far removed from the place of my birth, I will feel at home – and all will be peaceful and all will be silent this Christmas Eve night. I hope that you, and those dear to you, have a most special holiday, celebrated in your own most special way. Day 12 of the voyage dawned bright and sunny … with no clouds to speak of and a steady, though slightly lighter wind than yesterday, which means we’re not making quite the progress that we have the past few days. As you can see in the map below, there continue to be large storms in the North Atlantic that have pushed the high-pressure systems down, which in turn have pushed the trade winds south – and BoDream and I along with them. In other words, we’ve traveled a long distance out of our way to keep wind in our sails. If we hadn’t come this far south though, we’d be bobbing in no wind in the middle of the Atlantic and going nowhere at all. Considering the overall wind conditions we’ve encountered, and the forecasts we’re seeing, I’ve had to rethink our situation and make some revisions to the overall trip plan. As originally intended, the route to Charleston, SC had us heading south to pick up the trade winds, at which point we would curve up and around to Charleston … a trip we calculated at near 3600 miles. But the winds have pushed us so far south, that short of turning on the engines, there is little to be done. On a sailing craft of BoDream’s size, you simply can’t carry enough fuel to motor the crossing, unless you go absolutely nuts with containers and such. I’m carrying a lot of fuel already, but only enough to run the engine for a couple of days. So, what I’ve decided to do after crossing the Atlantic, is to land on the Caribbean island of Antigua … to stay for a short time, and then to make my way up to Charleston. 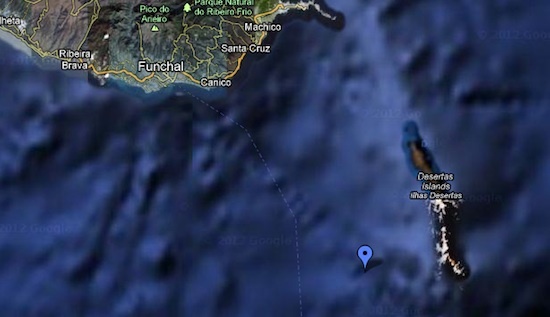 I’m pretty much in the middle of the Atlantic now – about halfway between the Amazon River and the Bulge of Africa. The only way to head north though is to first head west towards the Caribbean. 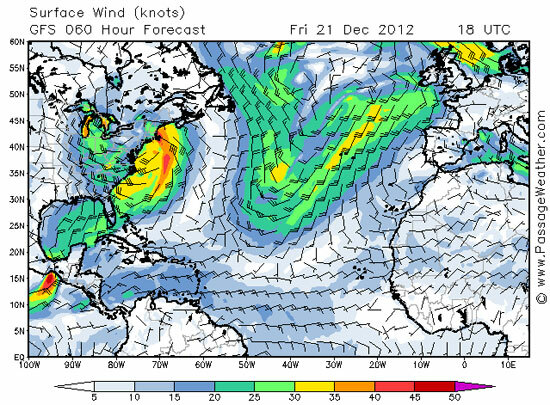 Given that Antigua is right along that route, and a popular stopping point, it only makes sense to dock for a few days of respite … and then once the current storm systems level out, to pick the next favorable weather pattern to head north. Attempting to go straight to Charleston is a long 3000 miles away, with even more iffy weather in-between. So it is … with some luck, I’ll be in Antigua before New Year’s. 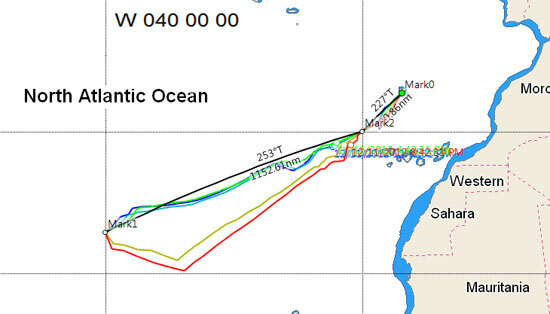 This is typical protocol for long-distance sailing … looking for proper weather windows to make the best of long passages. I’ve spent plenty of time in big storms, up to 60-knot winds and such, and what that teaches you pretty quickly is that when it’s not necessary … it’s NOT necessary. My general approach is to save karma points for when I really need them, and not to spend them unwisely resisting the ways of nature. Antigua is a small, Caribbean island, almost perfectly placed for the course we are on. It will give me a chance to get some good sleep, cold drinks and hot meals – three pretty attractive options at this point. It also allows me to take care of some necessary business before the end of the year. To get there though, I have to keep heading southwest (the curley red line above) before gybing to the other board and sailing on to the Caribbean. “Gybing” is a maneuver where a boat sailing in the same direction as the wind, turns its stern (its “rear-end”) through the wind, such that the wind direction shifts from one side of the boat to the other. So, I’ve got about 435 miles to go until that gybe point … another day or so, and then after that, about 1500 miles to Antigua. So, now that our destination is remapped, there’s not much to be done, but to go back to living (and working) the Dream – which, from where I stand is not too difficult. The moon is glowing in the western sky right now … only a quarter of it is showing, but with the clear skies, it is intensely bright and creates a proverbial “moon highway” – a winding and shimmering reflection across the water, right up to the boat. My course at the moment is directly in line with the moon. The large white spinnaker, covers over the moon which diffuses its brightness, lighting up the spinnaker from behind, giving it a ghostly glow, and each successive layer of sail and boat takes on its own different gradation of grey, black or white. The entire scene exists in black and white. The boat is white, the mast black, the mainsail dark grey … all illuminated from behind and layered into a porcelain-like sculpture against the waters sprinkled with shards of moonlight. It’s hard to stop staring at it actually, but there is work to be done – and a long way still to travel. Right now, the winds are almost directly behind me, but there is a high-pressure ridge in front of me too. That’s going to force me to Gybe (change course) and go southwest around 245 degrees to get under it - or else I will end up once again with little or no wind. My current distance to Antigua is 1620 miles … but remember, that’s the way the crow flies, not the Dave … Dave’s still 8 days away. One good thing – the goal of this voyage as a qualifying trip of 2000 trans-oceanic miles will easily be met. In fact, I’ll likely have 4000 miles under my belt, by the time I reach Antigua. In closing, I’d like to extend a salty welcome to all you new Facebook folks. Thank you for thinking enough of what we’re doing, to follow along. I’ll be back again soon – before Christmas for sure, with another update. 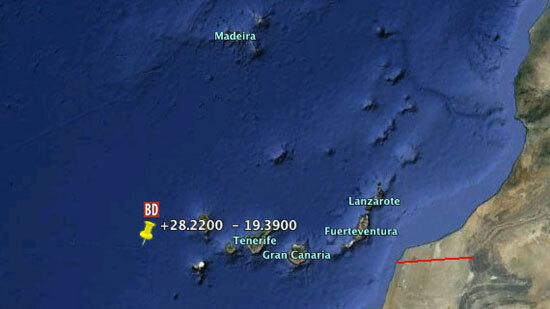 We are now sailing west of the Cape Verde Islands, some ten days into our first single-handed Trans-Atlantic crossing. In the interest of not filling your in-boxes with too many updates, I’ve decided to send along a kind of weekly “digest” – including some links to longer posts that I made, and that might be of interest to you, especially if you have not been following our oceanic “exploits” on the Bodacious Dream Facebook Page … where our status is frequently updated. So, if we are going to summarize … we best start at the beginning. 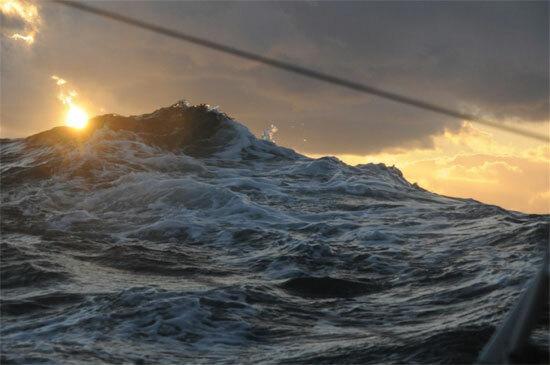 Week 1/ Day 1 … Bodacious Dream and I departed Calais, Portugal mid-afternoon on Friday, December 7th and pulled into large seas amid churning waves left over from an earlier storm that we had to wait out. The winds soon weakened, raising thoughts of the need for more fuel to keep the engine going for extended periods. 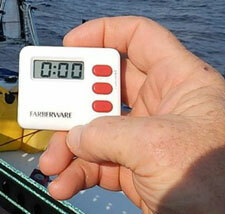 That first day we did about 170 miles, though BoDream can easily do 250, if the winds and directions are good. Day 3 … saw the slow winds continue – but when darkness fell, a great stillness descended as well, with the waves growing calm and the water reflecting the stars … making it difficult to tell where the sky ended and the water began. This is a phenomenon I remember happening on the Great Lakes in the spring, when the warm air doesn’t come down quite far enough to touch the cold water … so you have enough wind to sail, but the reflections of the sky, clouds and stars are perfectly clear. They call it “sailing through the heavens.” That is exactly what I saw here, and though I was motoring, and not sailing … it was still an awesome experience. Day 4 … looked to include an overnight stay in Madeira, but that plan was quickly scrapped because of the need to head south quickly in hopes of outrunning a high-pressure system. Getting to the trade winds is what we were there to do, and those fresh winds were ready to push us there. Over the course of the week, and with the help of our onshore team, we’ve been able to daily post Google Earth/Ocean images of our position, as well as our key speed markers. 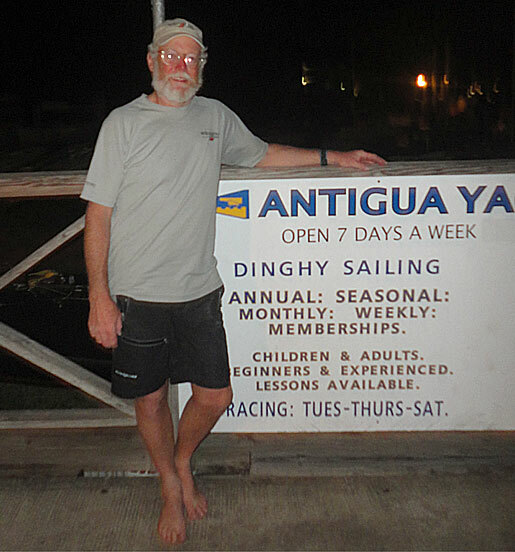 Day 5 … made for a beautiful day of sailing wherein we met up with those fabled trade winds. With the A3 (the “asymmetrical spinnaker”) up and full, the boat turned lively and gave us a lot of lift. It was exciting to finally have enough wind to “fly the chute” and overpower the waves. It was easy to imagine how ancient sailors must have felt blessed by the presence of such winds, and then sadly abandoned by the gods when those winds disappeared. Thankfully, BoDream has a fine new engine – so I am spared the labor of the oars. Week 2 … As the new week dawns, we are still moving well, and finally more westerly – though not always in the exact direction that we want to be moving. Sure, we know where it is we WANT to go … but instead of being able to go there in a straight line, the winds demand that you first go to the left and then to the right, and then back to the left – and so on. Crows don’t have this problem – sailing vessels do. It can be a bit frustrating sometimes … but what can you do … this is the Ocean and Mother Earth is in charge, that’s for sure. Me, I’m just trying to accurately read the winds and make the chocolate last. As this update is being sent, we are in the process of reviewing upcoming weather and wind projections, and so determining our course for the foreseeable future. We’ll keep you posted. To stay up-to-date with our more frequent reports from the water – the easiest route is to go directly to our Bodacious Dream Facebook Page and if you have not already done so, to LIKE us there. That way you will be able to see (in your Facebook “newsfeed”) our updates (both short and long) as they happen! I want to once again thank you all for the support you have shown me and our Bodacious Dream this past year. It means a great deal to me. In closing then – from both of us, winging our way to the equator – I want to wish you all a great and peaceful holiday season! Bodacious Dream and I are moving along quite nicely in these brisk northeast trade winds, finally traveling in a somewhat southwesterly direction. Today, at 15:15 marked the end of day seven, the first week of this Trans-Atlantic solo sail – significant for a couple of reasons. First of all, it marks the longest solo passage of my sailing career, eclipsing my two solo Super Mackinac Races, which were each 600 miles long. Those races started in Chicago and ran to Port Huron, Michigan traveling through both Lake Michigan and Lake Huron. Both of those races took six days. Since leaving Cascais, Portugal we have sailed over 1050 miles in seven days … including the quick stop for more fuel in Madeira. The other significant thing going on is that this trip is somewhat of a stepping-stone to the larger dream I’ve long had, of single-handedly sailing around the world. Sailing alone across the Atlantic was the first of my boyhood sailing adventure dreams. I actually remember the time and place that gave birth to that dream. It was a green cloth-covered book, a compilation of sailing stories, that I had pulled off the shelf in the Middle School library in Chesterton, Indiana. One of the stories in the book was about a man named Howard Blackburn. Howard Blackburn was a Gloucester, Massachusetts fisherman, back in the late 1800’s. In those early days of commercial fishing, larger sailing ships would take onboard a number of fishermen, along with their dories (a dory is a shallow high-sided boat about 20 feet long used by fishermen – like in the image here.) These “transport” ships would then sail a number of days out to the fishing ground. Once there, the fishermen and their dories would be lowered from the ship to fish for cod with hand-lines – long lines with multiple hooks on them. The laborious task of rowing to an area to fish, setting your line, following back on the line and pulling up the fish over and over was the business of commercial fishing in those days. 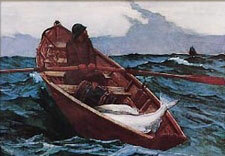 Howard was one of these sturdy fishermen. As often happened, the weather would change once out on the fishing grounds, and fogs would set in so that fishermen would be lost, unable to find their way back to the ship. This happened to Howard one day, and his only option for survival was to row the many, many miles back home through the harsh North Atlantic weather. In the process, Howard lost his mittens, which forced him to cinch his hands to the oars, so that he could keep rowing despite his frostbitten fingers. Somehow, Howard made it home, but ended up losing all of his fingers and some of his toes. That didn’t stop him though. From there, Howard went on to sail single-handed across the Atlantic, and spent a very full life at sea. Sailing alone across an ocean is no small feat, requiring determination, strength, preparation and skill (mixed with a heavy dose of luck) – but I still remember the amazement that I felt as a lad, imagining Howard’s courage in doing what he did minus fingers, and in an era when even what we would call “basic” technology was unavailable. So, back to today … it’s late at night here when I’m writing this … 2:30am, and BoDream and I are sailing along quite quickly under jib and mainsail with winds at around 20 knots. For the past day and a half, I’ve been sailing with the A3 (the large asymmetrical spinnaker,) but with the winds forecasted to increase to 25 knots, and realizing that I did not have the A3 optimized for solo handling, I prudently chose at dusk tonight to take it down and put up the jib. We are now flying through the night sea at speeds of over 10 knots on a heading for the south by southwest, and locked into the trade winds. When “Otto” (that would be our automatic pilot) drives the boat, I know he’s using the compass and wind instruments to fine-tune his course. When I drive, I get to mix in a bit more romance with it all. 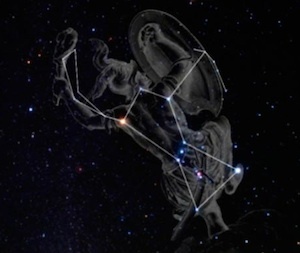 Presently, the constellation Orion, the hunter is directly over the mast. I sail my course by keeping the mast aligned with one of the stars in his belt. As you know, the stars move through the night. Orion begins the night just above the eastern horizon, and slowly moves into position for me to steer by him. Soon enough though, Orion will be off to the west, and I’ll have to find another star to steer by. Fortunately, there is no shortage of stars. Until the next story, enjoy! Boat Speed: 9-10 knots w/ surfs up to 14. At present, I’m only a few hundred miles off the coast of Africa and the Western Sahara Desert. The time is just past 01:00 UTC and the skies are clear, full of stars and the temperature is mild … an enchanting night on the water. Today made for a beautiful day of sailing. I finally met up with the trade winds this morning, and have been continuing to work my way south to get into the best part of them. With the A3 (that would be the “asymmetrical spinnaker”) up and full, the boat has been lively with a lot of lift. It’s great to finally have enough wind to “fly the chute” and overpower the waves. I could use everyone’s energies though to help petition the gods of the wind to keep pushing us forward and across the Atlantic. Right now, the forecasts are for them to peter out about halfway, which would mean a lot more time to make it to the States! Though part of me feels reluctant to recount it, here’s something of a funny story from last night. As the sailing was pretty steady, I tried to get in some extra napping. Fatigue is something you must stay in front of, as you never know when a problem might arise that needs all your energy. So, following a regular routine, that I explained in my Day 2 “kitchen timer” post, I scan the horizon for shipping traffic, set myself up with the timer in 15-minute intervals and lay down. When the timer goes off, I repeat the process. One thing about BoDream’s sleek racing design, is that there aren’t many creature comforts onboard. One that I’ve discovered is a nice spot to lie down on the floor (bilge) – right up against the engine box – especially nice after the batteries have been charged and the box is warm. It takes a few minutes, but much like heated seats in newer cars, the warmth radiates through the outer layers of clothing, and into my back where it even helps ease up some of my tightened muscles. I know this is not exactly what people look for in a heated back massage – but I’m grateful for it. 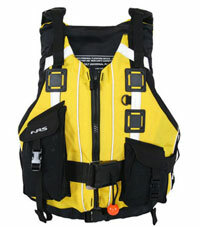 Anyway … part of the routine is to take off some of the excess equipment, in particular the auto-inflating life jacket. They call these things “Personal Flotation Devices” or PFD’s now, as I suppose that’s less scary sounding than life jacket. Whatever you call them, they don’t save your life, they just help keep you floating. Anyway, so I take that off, and set it on top of the engine box and then lay myself down to nap. So, I’m sleeping deeply in my idyllic 15-minute window. Now anybody that knows me well, can attest that attempting to wake Dave Rearick up from sleep, is akin to taking your life in your hands. Tim Kent remembers I’m sure. I come out of sleep with only one intention … to “neutralize” the situation and rid myself of all threats and adversaries. 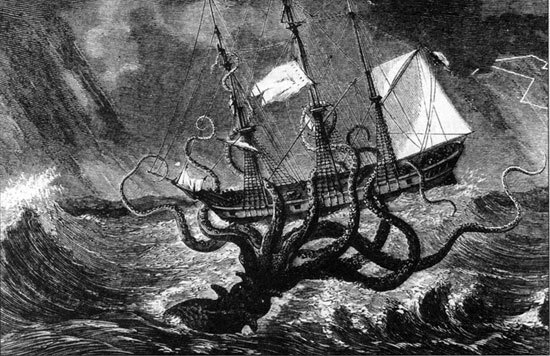 So, as I’m sleeping, the boat rises up and rolls a bit and this science-fiction octopus slides off the engine cover, and lands with a smack on my face and chest. Instantly, I jump up and fling this “thing” across the cabin, intent upon neutralizing it. With great courage and ferocity, I almost have it neatly skinned and filleted before I’m awake enough to even realize what is happening. Fortunately, the cabin is somewhat enclosed or I’d have sent the monster back to the evil deep from where I was certain it had come. It took me a while, but I finally climbed back into my own skin and finished out the night – though I can’t say much more rest was had. I’m grateful that Matt Scharl or one of the other BoDream crew members wasn’t onboard. I can shelter myself from the embarrassment of various details, that I know they would be hard-pressed not to divulge. Anyway, that’s what we do for fun out here. I’m looking forward to tomorrow. That was one quick stop in Madeira. Initially, l was planning on stopping there and refueling, and then spending the night before taking off again. But wind being the precious commodity that it is, that plan was scrapped because of the need to head south and west under the surrounding high pressure system, so that I might sooner meet up with the trade winds, which I’m hoping will carry me most of the way across the Atlantic. So it was this morning – a quick refueling, a quick shower and a quick stop at the grocery store … (no, not for more chocolate) … and then, it was off again. Bodacious Dream and I are taking this course to the southwest and will “error” a little farther west later tonight in an attempt to get 200 miles under our belt in this 24-hour period. That won’t be all that easy, but the winds have been “fresh” since we left, and that is helping. However, the forecasts are for the winds to fall off again tonight, at which point, I might have to go back to the using the engine. With something like 3200 miles to reach the Eastern seaboard, there’s still plenty of open ocean to sail the 2000-mile qualifying requirement for the Global Ocean Race. If by chance, we can’t do that this time around, there will be other occasions to do that run. This year, the weather has been particularly unpredictable. Typically, it wouldn’t require much of a plan to simply sail south to Madeira and then west to the Caribbean and up to Charleston. This year however is more of a struggle, even though I am told last year was an even harder struggle. Anyway, by Thursday afternoon, I hope we will begin to see the fruits of our labor, and the welcoming surge of the trade winds. Just where they will drop us off, is still up in the air. I’m hoping I’ve been enough of a good boy this year that Santa will allow me to have them all the way across. If not, well, maybe a late Christmas or New Year’s in the Caribbean won’t be bad consolation! So far, it’s been easy to get out some news each day. That may grow a bit more difficult as we start sailing faster into the trades. So stay tuned, and I (with the help of our shore crew) will do our best to keep you updated and entertained. It’s another calm night, as I’ve sailed myself into the middle of a large high pressure system with almost no wind. The hillsides of the island are full of lights, which are sweet to look at, and the temperature is pleasant … maybe 60 degrees, which makes it easy to sail slowly back and forth out here. We’ll take another look at the weather tomorrow and assess the chances of getting under a ridge of high pressure that is coming this way. I’m not too interested in “floating” across the Atlantic. We’re looking for some sailing winds here – and sooner rather than later! There is some hope that the tradewinds will settle down towards the end of this week, which should make the passage a fun one. So, until later, it’s check the surroundings, nap some and wait for dawn … due at about 08:00 hours!! It’s 01:05 on Monday, UTC. My speed has been about 6 knots all along, as there has been little wind. Right now, it’s just amazing out. Very calm … the waves have gone still and the water reflects the stars … with the phosphorescence kicked up by the wake of the boat, you sometimes can’t tell the difference between the sky and the water … giving the appearance of sailing through the heavens… which I think I actually am. That is a regular phenomenon I remember on the Great Lakes in the spring, when the warm air doesn’t come down quite far enough to touch the cold water … so you have enough wind to sail, but the reflections of the sky, clouds or stars are perfectly clear. They call it “sailing through the heavens.” That same look is what I’m seeing here, though I am motoring, and not sailing … but still, it’s an awesome thing. So, Day Two is in the logbook … 282 miles so far over two days can’t be called fast progress. But, we knew from the forecasts, that these first days were going to be slow going wind-wise – but what the heck – they still count to the progress home. Ode to the Kitchen Timer! One thing people often ask me, is about sleeping when sailing by myself. Well, with that wonderful invention called the kitchen timer, I am able to keep myself from falling asleep for too long a period of time. Typically, we figure that the horizon is about 15 minutes away. By that we mean, at the speed we are traveling relative to the closing distance of a ship still just over the horizon (the curve of the earth) the two vessels would take about 20 minutes to cross each other. That means that any ship that I can’t see that is just over the horizon, is about 20 minutes away. So, I set the kitchen timer for 15 minutes and clip it to the collar of my shirt or coat, so it beeps me awake, at which time, I take a critical look around and if there are no shipping traffic or navigation problems, I set it for another 15 minutes and lay back down again. This works pretty well, once you get used to trusting the timer. I’ve conditioned myself now to fall asleep quickly, and I usually wake up just before the timer goes off. Along coastal routes, the shipping lanes are pretty much predictable, but fishing boats can appear from anywhere. Once out in the open ocean, bigger ships can be going in any direction, and so more vigilance is necessary. While I only saw one ship last night, I’ve seen a dozen today heading in both directions. I suspect many of them are headed down towards the Cape of Good Hope at the southern tip of Africa. This little kitchen timer is great for many other jobs throughout the day too. The way Bodacious Dream is constructed doesn’t afford a great many visual observation points forward, so when I’m doing chores, I keep the timer going to remind me to look out every once in a while. They’re quite useful … so I always keep two of them onboard … just in case! As far as how I keep track of time, I stay locked into Universal Time Coordinated (UTC) on the trip for a couple of reasons. First of all, it’s the same time as Portugal is on, and so my watch is already set to it – and second of all, the weather forecasts come out on UTC time, so it makes it easier to keep track of them. In fact, I won’t change my watch back until I settle into a North American harbor. This might confuse some people, but it keeps me clear and consistent as to what time things are happening. The only problem is the shifting time of the sunrise and sunset … they keep arriving at odder and odder times in the day – but that gives my mind a bit of exercise in referencing what day and time it is. Right now, it’s 16:00 UTC (4:00pm) and maybe an hour and a half until sunset. The sun sets early here and rises later than at home. Sunrise this morning wasn’t until 08:00 or so. Makes me miss the long summer days back home, when we competed in the Mackinac Races, when the sunsets and the skies didn’t go dark until 22:00 (10:00pm) – and the skies grew light again around 04:00 in the morning! Here on the ocean this time of year in the mid-latitudes, with the sun working its way to its furthest point south, there’s a good 12 hours of darkness. It makes you have to plan ahead, what you have to do and when you plan to do it. Changing clothes for the night, for instance, is easier done when it’s still light out, as are things like preparing food. Right now, I’m having an evening cocktail hour repast of orange juice, cheese and crackers! It’s always the simple things in life that keep you going! The only wildlife I’ve seen so far on this trip has been a few dolphins that came by to play this morning. It’s always great fun to see them. They sure do look happy swimming and jumping along with us. So, with evening coming on, I’m going now to get things squared away on deck. With just a sliver of a moon, darkness will fall quickly … so I better get busy. Signing off for now, and many thanks for following along.